The Canine Good Citizen Program is a world renowned certification offered by the American Kennel Club. It is taking the concept of obedience to the highest level. There’s almost nothing more impressive than a well trained dog. And when that dog is as adorable as a Pug you have the best of both worlds. While many owners take pride in their dog’s behavior, did you know that there’s a certification that can be earned that will truly set your dog apart from the rest of the world? It’s called the Canine Good Citizen program and it was started by the American Kennel Club back in 1989 as a way to reward dogs who exhibit good manners. 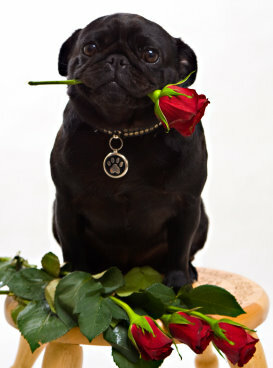 It is a formal testing process that leads to certification for your Pug. If you and your Pug enjoy working on obedience training this is a very worthwhile endeavor. It is for both dog and owner. The two part program will teach you all about the responsibilities of dog ownership as well guide you and your dog through obedience skills that will result in a well mannered Pug. The Canine Good Citizen (CGC) Program is a ten step process and can result in your Pug receiving a certificate from the American Kennel Club. It isn’t the end, however, in obedience training. It’s actually the first step and lays the foundation for future activities such as performance events where dogs are measured for their obedience, agility and tracking skills. If you’re considering showing your Pug this is a good starting point. It is one of the most popular and fastest growing programs in the American Kennel Club and it has gotten a worldwide reputation for excellence. Many other countries have modeled similar programs after the CGC Program. These countries include Canada, the United Kingdom, Australia, Finland, Denmark, Sweden, Hungary and Japan. There are even neighborhood programs that have been used by the local police to resolve community problems. Many owners comment on how much they enjoy working with their Pug on obedience training and their Pug seems to like it too! It can be a real bonding experience between Pug and owner and there is nothing more rewarding than to be able to show off your well trained Pug to everyone you meet. People love a well trained and obedient dog. You’ll never get tired of the compliments. Plus, it seems to make your whole house a calmer, more peaceful and organized place. Clearly it’s best to start early before your Pug creates any bad habits. Are Pugs any more difficult to train than other breeds? Some people think so just because the Pug is so playful and responsive to their owner. They literally go crazy when you walk in the door – they’re always happy to see you. Your arrival can be the highpoint of their day! Some indulgent Pug owners feel that restraining their little friend takes a little bit away from the bond that exists between Pug and owner. That’s not the case. A well behaved dog can be every bit as affectionate as an untrained one and the overall relationship will be much better when your Pug has been trained in proper household etiquette. After all, your Pug lives in the house – he shouldn’t run it! If you like working with your Pug and enjoy the goals of obedience training, the Canine Good Citizen program is an excellent pursuit. If you’re considering having your Pug participate in any shows or competition, it’s an absolute must! If it seems a little overwhelming right now, then don't pursue. Enjoy your time with your Pug. Remember, the Canine Good Citizen Program is only one of many activities that you can do with your best friend.